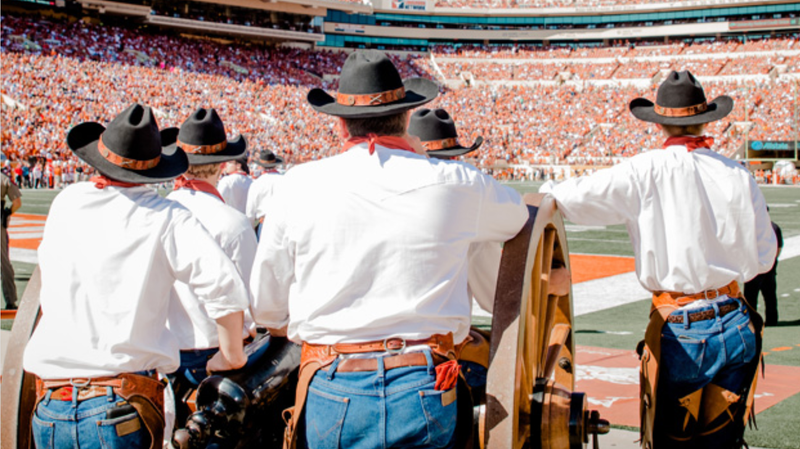 The University of Texas has suspended the Texas Cowboys, the fellows who fire the cannon at football games, for six years following an investigation into the circumstances of the death of a new member during a group retreat back in September. The investigation found that the retreat included a lot of hazing, and found, separately, that inadequate “risk management practices” contributed to the single-vehicle accident that caused the member’s death. “New members of the Cowboys were subjected to multiple forms of hazing, including physical brutality, physical activity, forced ingestion of unwanted substances, coerced consumption of alcohol and degradation,” the report said. During the retreat, the members were coerced to chug a gallon of milk and eat cat food, Spam, Tabasco sauce, minced garlic and whole onions, the document said. One member was coerced into biting the head off of a live hamster. Other hazing included paddling with sticks, forced calisthenics and so-called Oklahoma drills, in which two people run directly at each other in a confined space. Cumberland had apparently been paddled violently enough that his parents observed “marks [on] his back side” from the hazing in the hospital four weeks later, shortly before he died. Sophomore Gabriel B. Higgins’ blood alcohol level was found to be 0.21 percent, more than twice the legal limit for driving in Texas, where the drinking age is 21. Higgins died during an initiation held April 29 along the Colorado River for the Texas Cowboys, a fund-raising and spirit-boosting group. His disappearance in the river wasn’t reported until nine hours later, authorities said. Under the conditions laid out by the university, the group will reportedly remain under probation for two years after the end of its six-year suspension, and will be required to take a university-employed chaperone on all future retreats. The Cowboys have the option of appealing the punishment; in the meantime, the cannon the Cowboys fire—it’s called “Smokey”—is apparently owned by the University of Texas, which means continuing the game-day tradition will mean finding a more upstanding group of students to handle the job.